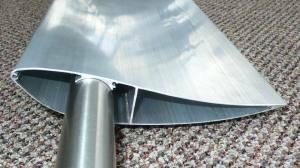 The GE-222 blade profile has been used by wind turbine builder Windcharger for many years. Its a proven performer with good all round performance. The GE-222 profile is now available for the aftermarket wind turbine industry. The blades are available in Wood, PVC and now Aluminium. 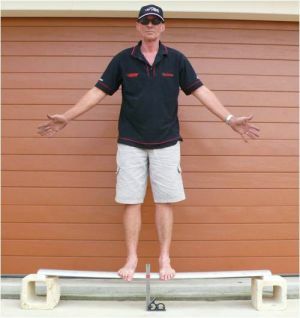 Better sheer strength at mounting points. Not UV affected, long life compared to PVC or wood. Easier and cheaper to paint , could be used unpainted with leading edge tape. Can be joined by using aligning dowels in the C channels to position until secured with rivets, allowing longer blades to be put together with the 1 meter maximum postage limit, potage is cheap compared to other freight methods. End caps are held with 4 small screws. By using small rod in the C channel in the ends allows easy balancing. These blades are supplied by Phill Mann of Oz Ax Wind Engineering. Price is $48.50 + GST ( AU )per meter. If you wish to inquire about ordering a set of the extruded aluminium blades, please fill in the form below. 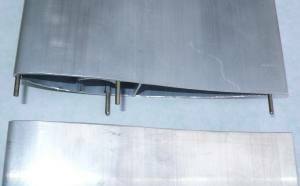 Like the PVC Blades, the Aluminium blades need a internal steel spar to mount and strengthen the blade. We recommend the 25-75 rule. This mean the steel tube needs to be at least 75% of the blade length, starting from the inner ( turbine center ) part of the blade, and the first 25% needs to be solid steel. See the Mounting Extruded Blades link below. Forum - ALUMINIUM BLADES UP - NEW HUB AND TUBES. You can email Phill for more information, remember to include your shipping address, and the number and lengths of blades required. 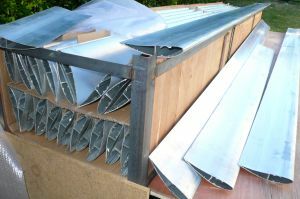 The aluminium extrusion is $48.50 + GST (AU) per meter, suggested max length of 1 meters. Price does not include delivery or additional end caps. No warranty is given as we have no control of the fitting and use of the aluminium extrusion. If you are not happy with the product, please return for a full refund before fitting ( drilling holes, cutting, heating ). Payments to be made to a BSB. No COD. Delivery commenced on confirmation of funds transfer. Postage by courier to be determined by weight/distance and confirmed prior to dispatch. End caps fitted to suit C/W rotation. Internal diameter of blade to suit 25/25.4 mm OD tube.